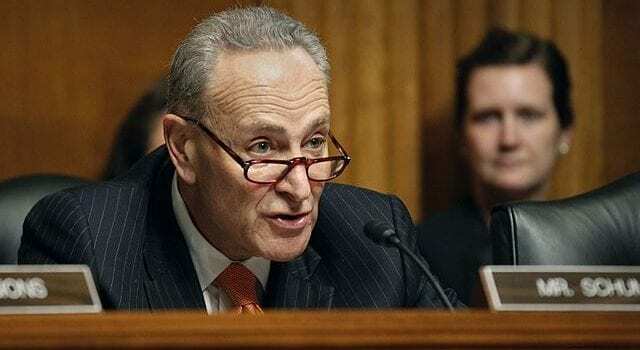 Democrats panicked on social media Saturday after mainstream media outlets like The New York Times and the Associated Press blamed them for an ongoing government shutdown, rather than Republicans and President Donald Trump. The White House did its best to label the shutdown, which began after Democrats whipped votes to filibuster a continuing resolution funding the government, offered by Republicans, as the “Schumer Shutdown,” after Democratic minority leader Chuck Schumer. To Democrats’ chagrin, the name stuck, and as they petitioned to keep the government out of working order over their commitment to illegal immigration, mainstream media outlets, who might typically be on their side, turned on Democratic leadership. In their rundown of the Friday night vote, The New York Times dared to suggest Democrats were to blame for failing to keep the government open. “Senate Democrats blocked passage of a stopgap spending bill to keep the government open,” the paper’s app blared in its mobile notifications. That single text message sent Democrats and activists into a panic. Dan Pfeiffer, a former Obama official and co-host of the podcast, “Pod Save America,” that encouraged activists to pressure legislators for the shutdown, was visibly agitated on Twitter after seeing the message. Others spent much of the day Saturday attempting to “refute” the NYT’s assessment by suggesting that by not acquiescing to Democratic demands which, for a time included an amnesty program for DACA recipients’ parents, it was the Republicans who were at fault for the shutdown. Previous articleDid Trump kill PC?